President Trump is a master distracter. Instead of checking his facts, check his policy directives. 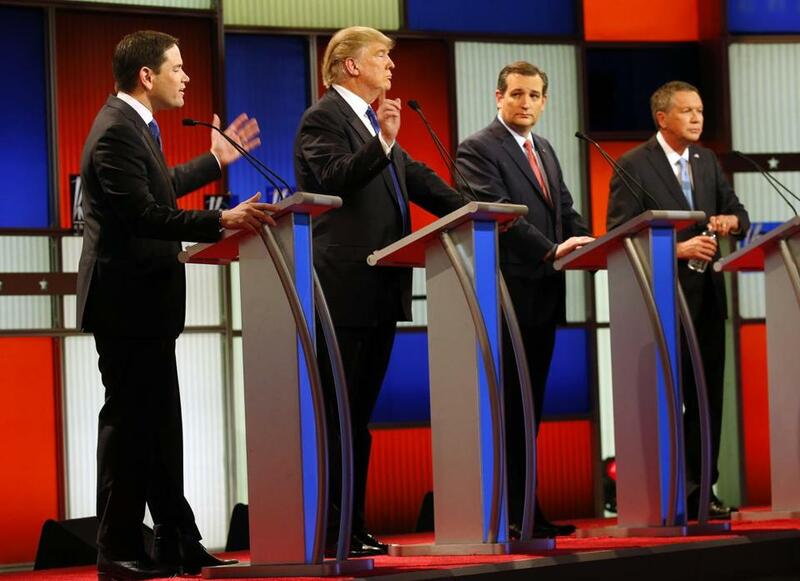 Marco Rubio, Donald Trump, Ted Cruz, and John Kasich during the Republican presidential primary in 2016. As you watch or listen to President Trump’s first State of the Union address on January 30, don’t get distracted. Look past the tweets and tune out his penchant for coarse discourse, and you’ll see that the real Donald Trump is a run-of-the-mill Republican. Yes, his was an unconventional candidacy, causing political observers and many Republicans to make the case that he is neither party loyalist nor ideologue. Democrats who crossed the political aisle to vote for him also cling to the notion that he is an independent, unlike any other established politician. Trump in fact is merely a master of the art of the distraction, which has allowed him to successfully turn the public’s attention away from the policy implications of his administration’s actions. The first year of the Trump presidency in essence represents a sustained, concerted effort to undo policies put in place by the Democratic Party. Political parties exist to win elections and enact their preferred policies. Achieving sufficient power means having the ability to reverse signature work by prior administrations of the opposite party. Ronald Reagan spent a great deal of time and energy trying to undo the Great Society programs enacted under Lyndon Johnson; Bill Clinton refocused the federal government on domestic rather than George H.W. Bush’s foreign policy; George W. Bush undid Clinton’s budget balancing with a tax cut bill and two wars; and Barack Obama reversed his predecessor’s policies on the environment, education, and reproductive rights. Despite what some have argued, Trump is not driven by a jealous obsession with Obama, at least no more so than the typical Republican. Most, if not all, the other Republicans who ran for president in 2016 would have taken similar actions. Marco Rubio would have revoked or limited diplomatic relations with Cuba; Jeb Bush would have expanded support for public and private charter schools; Ted Cruz would have rolled back support for affirmative action and federal enforcement of civil rights, including LGBTQ protections; and John Kasich would have nominated a Supreme Court justice just as conservative as Neil Gorsuch, especially on issues of women’s reproductive rights. All of them would have rolled back executive orders designed to address climate change and environmental protection more generally; all of them would have tried to repeal some or all of Obamacare; and all of them would have worked with the GOP Congress to produce a tax cut bill. And despite Rubio’s sponsorship of a DREAMer bill and Jeb Bush’s moderate personal stance on immigration, as president none of the above would have supported a path to citizenship for DACA holders or a more general amnesty bill for undocumented immigrants. The Republican base would not have stood for it (as George W. Bush discovered when he tried immigration reform). Party loyalty lives strong and dies hard in America. Bob Corker and Jeff Flake aside, elected Republican members of Congress generally support the actions, if not the words, of this Republican president, in part because he toes their policy line. The GOP members in both the House and Senate have largely voted for Trump administration policy preferences, with the lone exception of a few senators on Obamacare and a few vulnerable members of the House from high-tax states who opposed a tax bill they knew would pass (besides, tax cuts bring happiness across party lines). For those distressed that America elected a president who expressed and espoused intolerant views about race, ethnicity, religion, and immigration, and who was accused of sexual harassment, don’t blame white men in Michigan, Wisconsin, and Pennsylvania. Recall that 63 million people voted for Trump, and he won 89 percent of voters who identified as Republicans. Waiting for the GOP to reject its president, much less impeach him, is a fool’s errand. There are cracks in the GOP policy armor at the state level. The Republican Party holds 33 governorships and controls both chambers of the legislature in 32 states. But 26 of those governorships are on the ballot in 2018, and the political observer Larry Sabato’s Crystal Ball rates five toss-ups and another 13 in play. We have seen some Republican governors push back against select Trump administration policies, like declining to provide voter information to a now-defunct voter fraud commission, opposing a full repeal of Obamacare without replacement, and supporting the extension of the Children’s Health Insurance Program (CHIP). But Republican officeholders won’t offer more than token resistance to President Trump until they sense that their own partisan constituents, Republican voters, have had enough. So far, with exceptions in Virginia and Alabama, the vast majority of Republican voters have not opposed policies put forth by the Trump administration and supported by the GOP-controlled Congress. The president will, either in the State of the Union address or tweets about it, make incendiary remarks. When he does, instead of firing off your own comment, do this: Find out about his latest executive order or a policy directive issued by a Cabinet department. Watch how federal programs change to reflect GOP policies, such as the new work or community engagement requirements for Medicaid recipients in Kentucky. If you agree with GOP policy, you are a satisfied voter despite discomfort with the way Trump conducts himself. If you disagree, use this November’s elections as the Founders intended: a mechanism to change course on policy. Doing so will require changing the party in power.